Welcome to my little corner of Blogger’s Quilt Festival. I was blown away and inspired. Sheila at Thought and Found was hosting ‘Oh My Stars – A quilt-along’ it had already started but I thought it wasn’t too late to join in. Sheila was proposing to use vintage sheet fabric which you will know if you’re a regular reader that I’ve been collecting them for a while and wanted to get using them. So this fitted in with my plan to not buy fabric and to use up some vintage sheets! I’m not a very experienced quilter, I’d certainly never made a star before. Now I can confidently say I have made over 100! There are 15 different types of 8 point star in this quilt, some were far more challenging than others! I almost managed to catch up with the quilt along, and managed to finish all the star blocks by the middle of March and had it pieced, basted, quilted and bound well before the end of April. That is speedy for me. 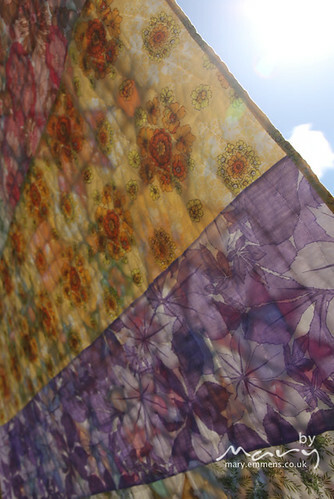 Last weekend the sun was shining after what feels like weeks of rain, so we took the opportunity to get some photographs of the quilt in our local park. The basketball court provided the ideal fencing to peg on to. Someone else saw the chance for a quick nap! If you’ve come over from the Blogger’s Quilt Festival thanks for visiting and please leave a comment if you have time. AND I’d be delighted if you came back on Monday for the start of the Sew Mama Sew Giveaway Day. Delightful, your starry quilt. Thanks for sharing! It’s a beautiful quilt. I love the stars and the napper is precious. 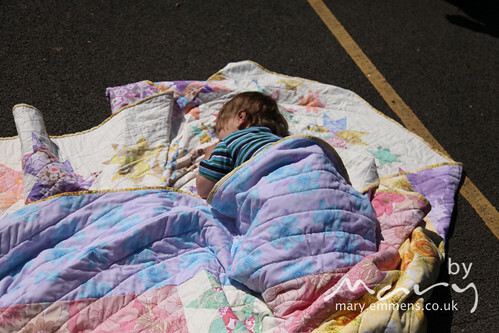 Wow that quilt is beautiful Mary, I can’t imagine how many hours it took to make all those stars! The quilting really makes it. A fabulous star quilt. 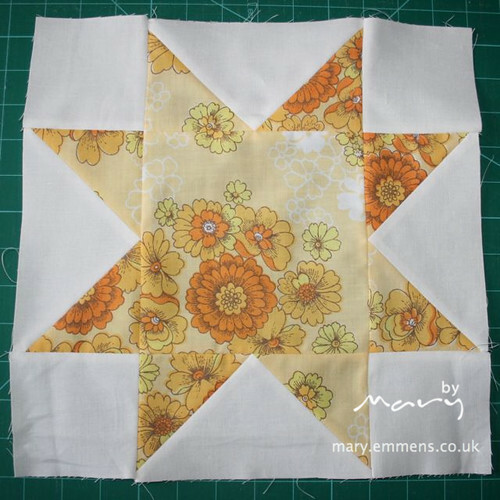 Love the backing too and the simple circular quilting is perfect. I love this idea. Can I please have this quilt hehehehe I LOVE IT!!!! Nothing like getting good at something by doing tons of them!! I absolutely love the way you used sheets to make the stars! I have stacks of florals and haven’t been able to find the perfect pattern! I just found it!!! Thank you for sharing! Love, love, love your quilt!! I love this quilt – very pretty. Love that it’s made from sheets, too. This is so pretty! You should be very proud of the great job you did on this, the circular quilting is just icing on the cake. Fantastic. Hee hee, I just love your idea of ‘manageable’. It’s fab though, love all the colours in it! Oh my stars what a beautiful quilt. Love the bright happy fabric, Love the white background making those stars float, Love the quilting pattern, Love the back, and Love Love that precious picture of your little one under quilted covers! Oh! This is wonderful. I love the big circular quilting too– what a neat finish! This is delightful! I love the colours and I love your quilting. It gives the quilt a real feel of a galaxy of stars. Lovely! This is a lovely quilt, such a great way to use vintage sheets. Your circle quilting gives it a great finish too. I’m not sure this was “manageable”. 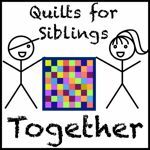 I took part in this quilt along too, and although my quilt top is finished, the bastin, quilting and binding is still on my to-do list – you have re-inspired me to get a move on – beautiful! I love your quilt. 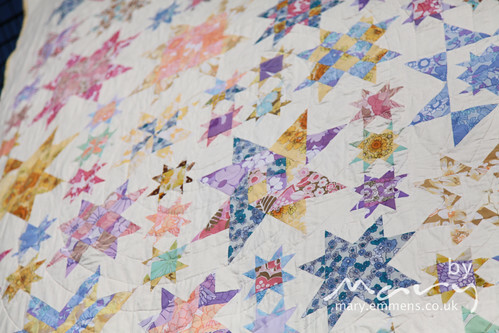 Stars are among my favorite quilts, and yours is just lovely! What an interesting and striking way to quilt the quilt. I’m definitely putting that into my “gotta do” list. Thanks for sharing. This is adorable! Love those stars!!! 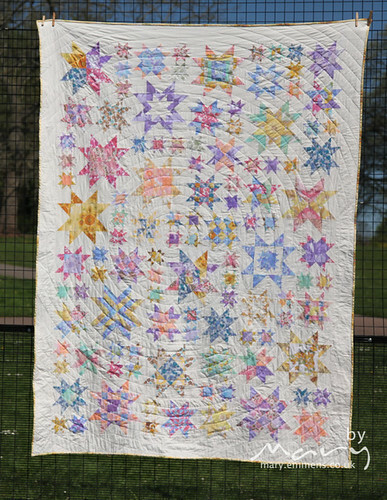 Oh my stars – what a wonderful quilt. Come see my entries 64 (repro. applique) and 85 (antique appliques). Beautiful Mary, the design really shines with the vintage prints! Just lovely, all those stars, great job. I love that! The quilt just sings, it’s so beautiful and the colors are so perfect. Thanks. Very sweet. Love the quilting. Your quilt is so pretty. That’s quite a commitment to something that was supposed to be manageable. You are a star making queen! Great to see it’s getting good use! I love all the variation of the stars- it looks like a night sky… I particularly liked the swirling quilting that gives the look of movement in the sky- very pretty – The back is very fun too. Thanks for participating in the blog hop. Enjoy the festival. Just wonderful, the quilt and story. Wow! This quilt is gorgeous! Thank you for linking it up on the Vintage Sheet Blog Weekend Link Up Party. I saw this on the festival and had to come say way to go!!! I have not even started mine. I am going to be using Hawaiian prints and a sea blue background. I am sure it will be adorable when it is done. I love yours though, adorable. That is an amazing quilt! I had never thought of doing a whole quilt with vintage sheets, what a fabulous idea!